Due to the ongoing writer's strike, the return of dramatic TV is looking increasingly bleak. HBO comes to the rescue with In Treatment . They couldn't have presented the drama at a better time, or in a more accessible format. Though Sylvester Stallone left the ending open enough to allow for even more sequels, this deserves to be the last Rambo film. The movie's final scene ends the series on a graceful note, a subtle reference to the first scene in First Blood . And even though the violence and gore is the most brutal that this series has ever seen, it is evident Stallone is commenting on both the political and artistic baggage which has often weighed down the character. The film picks up 20 years after Rambo III . 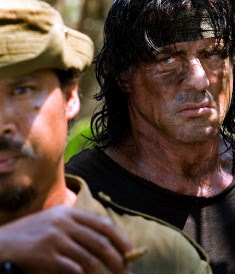 Rambo is still living in Thailand, though he is no longer living in a monastery nor stick-fighting to support himself. He has now retreated further into Thailand's jungles where he runs a small crew that sells snakes to a local snake-fighting showman. Thought he couldn't verbalize the demons haunting him before? He is even less prone to talk now. Which is why when a group of missionaries call on him to ferry them up to Burma, rife with the destruction of a genocidal civil war, he wastes little time in his monosyllabic refusal to take them up there. But when one of the missionaries, Sarah, connects to him on an emotional level, he gives in. He journeys up the river, evoking images of Apocalypse Now , for this is Rambo's heart of darkness we are voyaging into. Ten days after he has dropped his passengers off, Sarah, and her fellow missionaries have disappeared, possibly being held captive by the Burmese army. Guess who must rescue them? 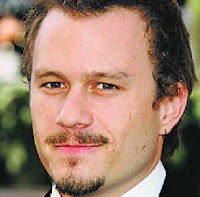 Heath Ledger was found dead today. He was 28. First coming to prominence in lighter roles, like in 10 Things I Hate About You , the first glimpse of deeper talent lay in his performance in the grim Monster's Ball . In it he played Sonny, son of Billy Bob Thornton's Hank, a son caught in the devastating cycle of psychological abuse that father unleashes on son after being victimized himself by his father before that. And though one can argue that Brokeback Mountain is vastly overrated, Ledger's portrayal of Ennis Del Mar is not. He is the anchor in that movie and says significantly more in his depiction of unfulfilled love than his costar Jake Gyllenhaal in a far more understated characterization. The legacy he leaves behind is incomplete for now. His final performance as the Joker in The Dark Knight will not be seen till summer.